Sarah has been the visionary and driving force behind Action in Africa since inception, serving as the organization’s Executive Director for over a decade. As President, Sarah is responsible for everything from strategic planning, fundraising, and operational execution to participating in dance classes at the Center and sleeping at the hospital when our students get malaria. Sarah has spent extensive time studying non-profit management, taking undergraduate courses on education-based non-profit strategy and volunteering for organizations like the Special Olympics and Sexual Assault Victims Services. While her broader objective is to provide students and community members with educational opportunity and social services, there has always been a special place in Sarah’s heart for those with special needs. This passion, informed by personal and academic experience, has driven Sarah to institute various programs at Action in Africa tailored towards the sick and disabled, including a Women to Women Group for vulnerable women and a fund to support children with special needs. Likewise, Sarah fervently believes in the importance of personal empowerment, viewing Action in Africa as an instrument to help students realize their own potential. In particular, Sarah has focused her efforts on empowering high schoolers, working with career-oriented Ugandan professionals to put on panels for our students. By introducing students to doctors, creative artists, and entrepreneurs who grew up in villages similar to Nakuwadde and households like their own, Sarah has inspired our students to take control of their lives and dream bigger. Sarah, who writes in her journal every day, graduated from Chapman University with a degree in Integrated Educational Studies in 2012. Juliana is 24 years old and from Masaka. She graduated from Makere University’s Business School in 2013 and worked in a cosmetics and after that she worked as a secretary in a property management firm. She now resides in Nakuwadde just outside Action in Africa’s gate which is how we came to know her and eventually hire her as our adult English teacher. The english program is quickly growing and Julianna has made great progress with the students. She even has our own Mama Harriet doing homework. Mama Harriet is the house mom—she helps with cleaning, cooking, and laundry. She is 35 years old and has two children with her husband (Tata Harriet). She grew up in Mukono district and now lives in Natete. She has been working with Action in Africa since January 2015, the day the Center opened in Nakuwadde and there’s no way we would ever let her leave. She has the best laugh in all of Uganda and she brings smiles to everyone working hard here at the Center. Mama Harriet is a big mama with an even bigger personality. She says she loves Action in Africa because it is a place full of love and respect and it feels like family. Benard (or Bennet as some Ugandans call him) is 34 years old and was born in Lira where he lived until he was 10 years old, and then he lived the remainder of his life in the Kampala area. In 2010 he joined a security company which he worked in until he joined us here at Action in Africa. He found a job opportunity after his old boss found a Facebook post that Action in Africa was looking for a security guard, and his old boss was leaving Uganda, but he wanted to make sure he found his employee a new job because he believed he was such a good man. Samantha Cressey joined Action in Africa in 2017, and she focuses primarily on securing grant funding, developing community partnerships, and tracking and analyzing quantifiable metrics to determine the success of our programs. Samantha joined us from Project Hope Alliance, a non-profit in Southern California that is working to end child homelessness. While at Project Hope, Samantha served as an Education Program manager, overseeing the program development, day to day management and outcome reporting of two educational programs for children aged 4-12 who were experiencing homelessness in Orange County. Likewise, Samantha has volunteered at various non-profits on the African continent and has spent time living and studying in South Africa. After meeting Sarah Nininger while at Chapman, Samantha grew interested in Action in Africa, as the organization’s mission to empower youth and marginalized people through education and community development matched her own passions and ambitions. Today, AIA provides Samantha with a platform to combat global gender inequality, as she contributes to the organization’s initiatives to provide girls with educational and career opportunities. Samantha received her BA in Political Science and Sociology from Chapman University in 2015. Isaac is one of the security guards here at the Center and he is 32 years old. He was born in Sororti district, Balulu county. He first came to work in Kampala in 2006 and worked for a security company and then in 2012 he resigned from that company and worked as a personal assistant for a businessman. His friend, Benard, was already working for Action in Africa as a guard and when we were looking for a second guard we were able to bring in Isaac. He believes the most important work AIA does is the Secondary Scholarships. Brenda is our Center Manager which means she oversee’s the daily operations of the Center and the well being of the staff and students. She is 33 years old and has two children: Sharif and Nissi. She grew up in Kampala and lived in Masaka for a short time before coming to Nakuwadde. She started with Action in Africa in April of 2015 and quickly became an integral part of the operation. Brenda is a humble and kind person who truly loves helping people and acts as a mother to all who come through our gate. Maggie Brown has been with Action in Africa since the beginning, serving in a variety of different roles that currently include Vice President and Creative Director. Following an eight month stay in Nakuwadde in 2015, Maggie quickly emerged as Sarah’s right hand woman, charged with running and designing programs at the center, working directly with our students and community members, and bolstering AIA’s fundraising efforts in the U.S. Maggie, who first became involved with Action in Africa as a high school student, has remained deeply passionate about the organization for the past decade, flying back and forth from Uganda to the U.S. to promote the best interests of our students. The work that Maggie does at AIA is congruous with her interest in education, as she is a firm believer in the importance that education plays in facilitating economic development and raising standards of living across the globe. 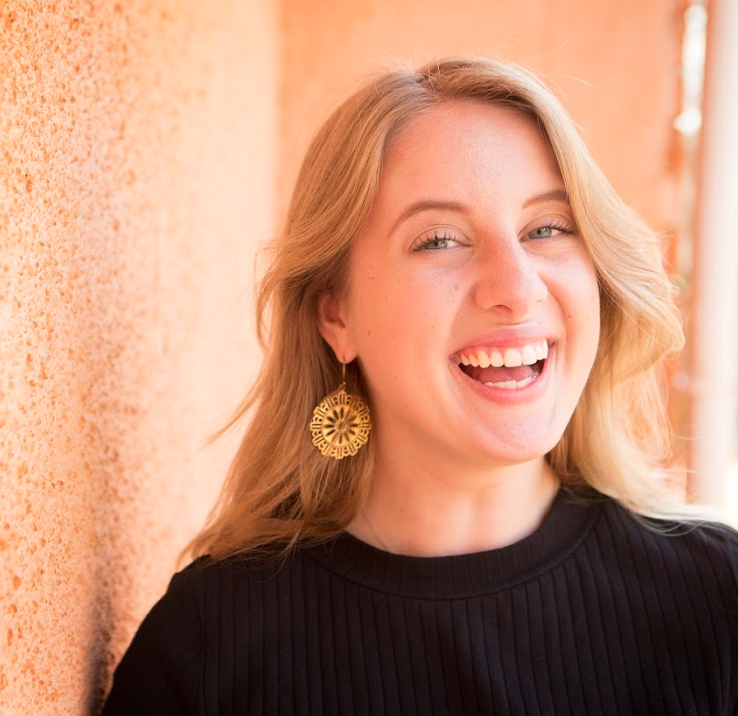 Maggie, who is an aspiring slam poet, received her BA in International Relations and Global Studies from the University of Texas at Austin in 2017.